PHOTO: G. Michael Graham, Fort Thomas Matters. Highlands junior Maggie Hinegardner (13) slides over on defense against Simon Kenton's Maggie Jones (left). Highlands won its 25th game this season with a 48-38 non-region victory. The game is normally hard-fought to the end. That was the case in this one even though the Highlands Bluebirds girls basketball team (25-4 overall) led from the first basket just 14 seconds in until the very end in a 48-38 non-region victory over the Simon Kenton Lady Pioneers (17-10). Highlands reached 25 victories in a season for the first time since going 30-4 during the 2014-15 season. PHOTO: G. Michael Graham, Fort Thomas Matters. Highlands senior guard Chloe Jansen starts a play in a recent game. The Highlands Bluebirds girls basketball team originally had a game scheduled Friday at Conner. But Conner had to make up a 33rd District game against Ryle. But Highlands (24-4 overall) found a rematch against the Scott Lady Eagles instead winning it by a 70-51 score in Taylor Mill on Saturday for a 10th straight win equaling last year's win total. PHOTO: G. Michael Graham, Fort Thomas Matters. Highlands junior Jacob Brass (rights) get down in defensive position in a recent game. Strong defensive efforts have been helping the Highlands Bluebirds boys basketball team (17-10 overall) down the stretch. Another one in Erlanger on Friday led to an impressive 55-34 9th Region win over the Lloyd Memorial Juggernauts (15-7). Highlands has won seven of its last eight games and is 11-2 in region play. Lloyd Memorial has lost three straight and is 8-4 in region play. "You like for your seniors to step up and raise their level of practice and focus," said Kevin Listerman, Highlands Head Coach. "I felt like we had a couple good days of practice leading into (Friday). At this point of time, you are who you are as a team. You try to fine-tune things. The biggest thing is having guys understand their roles and excel in the things that you ask them to do. I felt especially defensively, we did that." PHOTO: G. Michael Graham. Highlands seniors Jack Hegge (3) and Alex Starkey (32) slide over on defense in a recent game. The Highlands Bluebirds boys basketball team (16-10 overall) made Senior Night special in a 74-58 non-region win over the Mason County Royals (10-13). PHOTO: G. Michael Graham. Highlands senior Zoie Barth (10) brings the ball up-court in a recent game. Barth is second in career scoring in program history with 2,287 points. The Highlands Bluebirds girls basketball team (23-4 overall) came charging out of the gates and cruised to a sound 72-49 victory Monday over the visiting Holmes Lady Bulldogs (6-14). Highlands has won nine in a row and moved to 11-2 in 9th Region action. The Lady Bulldogs have been to four straight region championship games winning it in 2016 and 2017 before advancing to the state quarterfinals and semifinals respectively. But they are struggling this season under first-year head coach Danielle Wells. Highlands senior guard Zoie Barth made another historic move with a double-double of 23 points and 12 assists to go with four steals. Barth moved into second-place in Highlands girls hoops history with 2,287 career points. Head Coach Jaime Walz-Richey leads that list with 4,948 points, which is second for both boys and girls in Kentucky history behind Jenkins 2016 graduate Whitney Creech's 5,527 career points. "It was great to see. We moved the ball extremely well," Richey said. "That's one thing that we really emphasized after the Dixie (Heights) game. We had to do more than one pass before we shot the ball and for the most part, we did that." PHOTO: G. Michael Graham. Highlands senior post Ben Sisson (center) dribbles in a recent game. He had 17 points to help the Bluebirds to a 45-43 win over Oldham County. The Highlands Bluebirds boys basketball team (15-10 overall) trailed the Oldham County Colonels (16-9) in the rematch from earlier in the season. But this time in Fort Thomas, Highlands found a way to win at the end, 45-43. Highlands sophomore point guard Sam Vinson took the ball on the left corner, drove the baseline and put the ball up between two Colonel defenders drawing a foul with six seconds left. The ball rolled around the rim before dropping in. Vinson then hit the ensuing free throw to make the final score. "We drew up a play and once they swung it to me, I saw the gap and drove the gap to the hole," Vinson said. "I saw two people in front of me and I thought I could finish on top of them so I just tried to get (the ball) up there and (finish the shot)." PHOTO: G. Michael Graham. Highlands senior Chloe Jansen (34) sets up to shoot a free throw in a recent game. 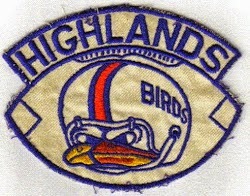 The Highlands Bluebirds girls basketball team has had its way with the Dixie Heights Lady Colonels over the years. But the last two have been very close. Highlands (21-4 overall) once again escaped 14-8 Dixie Heights, 52-51 with exactly one second left. The Bluebirds moved to 9-2 in 9th Region action with the win.